That’s always been my motto until now. And this is the drink that converted me: Spiced Golden Milk Hot Cocoa. You see, I’m not a lover of sweet things. I love chocolate but it has to be super dark and only in small quantities so hot cocoa has never been my ‘thing’. Admittedly, I do like the whipped cream (which is divine when dolloped into a hot cup of black coffee!) but this recent round of Whole30 has finally gotten it through my thick, thick skull that dairy and I do not play well together. Which is why this recipe is 100% dairy-free, not too sweet and plenty chocolatey! 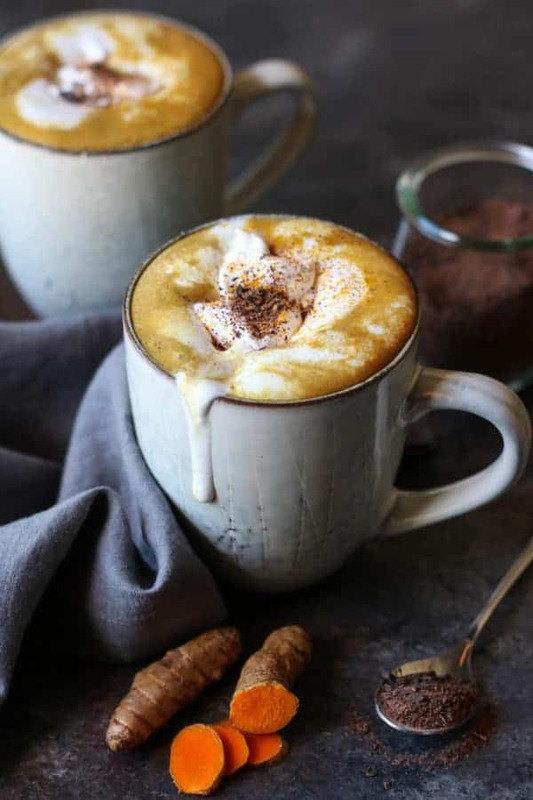 No, this doesn’t mean that I’m giving up coffee it just means that instead of my go-to cuppa decaf after a day on the slopes I’ll be reaching for this Spiced Golden Milk Hot Cocoa instead. And, it gets better. It’s also infused with some of my favorite warming spices and a touch of honey and features turmeric for it’s powerful anti-inflammatory properties and rich-earthy flavor. Really, it’s just a dark chocolate lovers twist on the ancient elixir, golden milk, made with turmeric which makes it all that much more perfect for curling up with at the end of a long day. 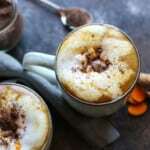 Why add turmeric to hot cocoa? The obvious answer is that it’s good for you. Turmeric is one of those hot new-old fads like bone broth. It’s a food that’s been used for centuries by ancient cultures to promote better health and lately it’s been enjoying the spotlight for it’s powerful anti-inflammatory properties and it’s ability to boost the immune system and promote relaxation. All this goodness is made possible by a knobby, brightly-colored root that’s rich in the active compound, curcumin. 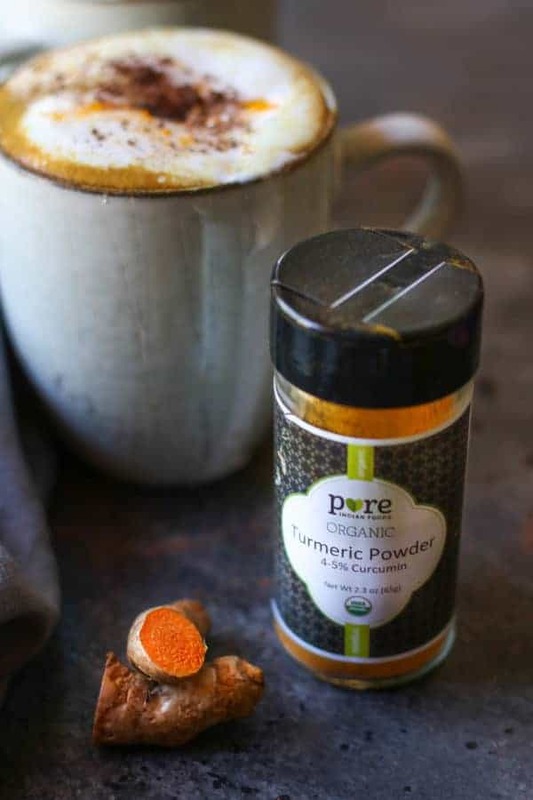 Your average turmeric powder contains up to 3% of curcumin by weight, in case you were wondering (which is why I love the turmeric from Pure Indian Foods – not only is it organic but it’s higher in inflammation-fighting curcumin to help me recover faster from CrossFit and other active outdoor pursuits). 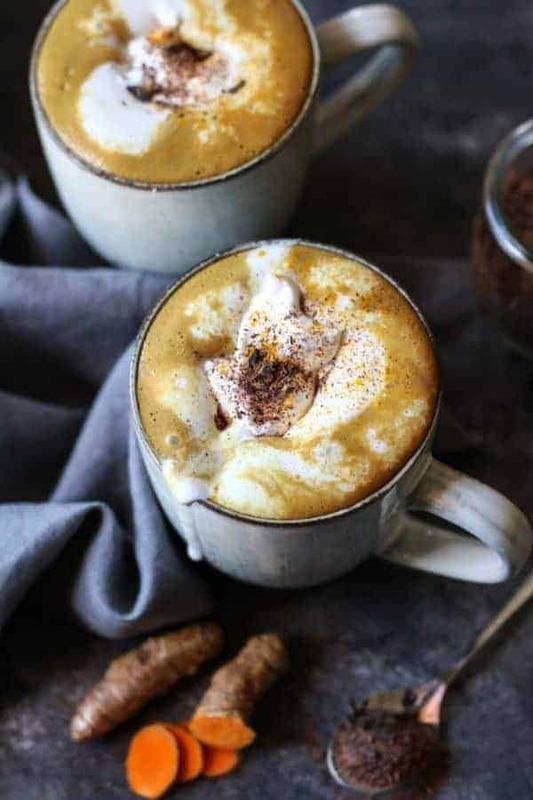 Just a minute now, before you rush off to get the recipe for this ridiculously decadent Spiced Golden Milk Hot Cocoa you should know how to get the most benefit from the turmeric – and sound really smart the next time you whip up a batch for some friends after a day of adventuring. A little fat. The active compound in turmeric is fat-soluble, meaning it needs fat to be absorbed by the body. Fat also gives this drink a luxurious mouthfeel and helps stabilize blood sugars so don’t fear the fat here. Okay, enough talking. 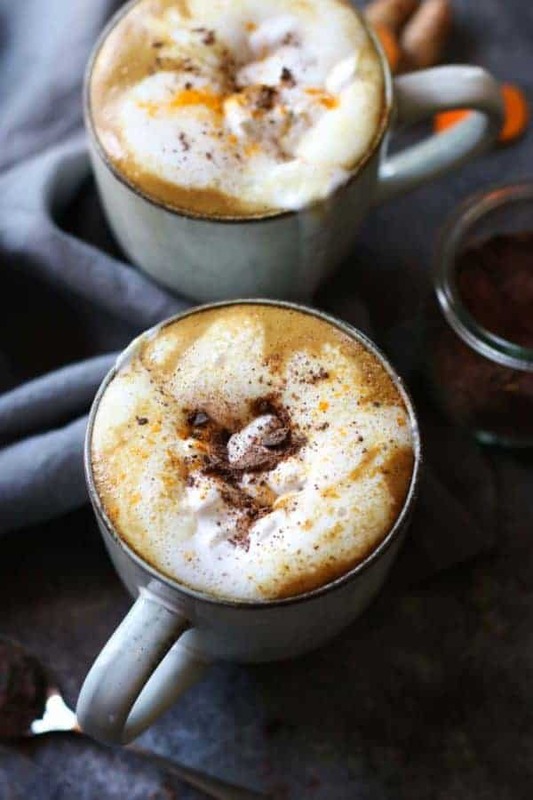 You’ve got to try this Spiced Golden Milk Hot Cocoa! In a medium saucepan, warm coconut just to the point of a light simmer. Add cocoa, turmeric, ginger, cinnamon, pepper, honey or maple syrup and coconut oil. Whisk vigorously or use a handheld immersion blender to combine. What’s your favorite way to dress up hot cocoa? Share in the comments below! This sounds great but wondering if I can use almond milk instead of the coconut milk? Thank you. Hot chocolate + golden milk?! Can’t wait to try! The best combo! We hope you enjoy! In the instructions , the dry ingredients have salt, did you mean pepper? Definitely gonna make this! Of course! If you tolerate dairy, ‘regular’ milk is amazing in this recipe. We are allergic to coconut and all other tree nuts in our house. You mentioned there needs to be far to absorb the turmeric. Can we use rice milk in replace of the milk? Is there a replacement for the coconut oil? Yes, you can use rice milk in place of the coconut milk. Ghee is an excellent substitute for the coconut oil. enhances the flavor of the turmeric and the cocoa powder, both of which can be somewhat ‘earthy’ tasting without the sweetener. Your recipe calls for cocoa powder. What about Cacao instead? Cacao is a perfect substitute. I tested the recipe using cocoa powder simply because it’s more widely available – but I use them interchangeably at my house. Is there nutmeg in the recipe? I see you say it in the story but don’t see it in the ingredients. Hi Dee! Yes, the recipe should say “Pinch of black pepper AND ground nutmeg”. Just updated the recipe accordingly. Thanks for the catch! Enjoy! Hi! Love your site. I’m just getting around to trying this recipe and all of a sudden the ingredients aren’t showing up for me! I just made this recipe and it tastes great but for some reason my beverage isn’t golden, instead it’s just dark brown like dark chocolate milk. Could it be that I did something wrong and that the tumeric isn’t developping the right way. Or did I just add to much cacoa? It could have been that your turmeric wasn’t as intensely colored or that, like you said, you added too much cocoa or your cocoa was just very richly colored (which is sometimes the case). If your turmeric is rather pale looking and you’ve had it in the spice cabinet for a while, you may want to consider replacing it as it does lose it’s potency (and thus color and health benefits) over time. I’m so sorry to hear that you’re struggling with these health issues. I really like the premade Golden Milk mix from Gaia Herbs. You just mix it with your milk of choice along with a little cocoa powder and sweeten to taste. I suppose you could but I don’t think the flavor would be very agreeable.